Chadis Crafts - Hat Pins. More Hat Pin pages. Now 5 pages long! Jewish Styles 4" to 8"
Other styles and colors available. Email me to design one together! People tell me they would also use it as a cocktail/olive skewer! 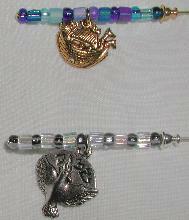 Both charms available in pewter and golden pewter. 4" style $10.00 each plus shipping. 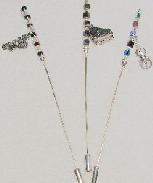 Music, Band, Orchestra and Teacher's Apple Stick pins 4"
Pewter Xylophone, piano and violin. Drum set, tamborine, clarinet also available. 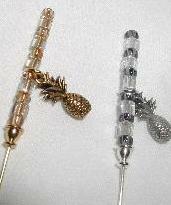 #4 to #8 Stick pins Pewter and Golden Pewter Charms. Colonial America's good luck/welcome/good health symbol= pineapple.